Movie thoughts and fiction updates. The story is about the wife to a disgraced governor in Japan and their two children. The governor was too lenient to his subjects, trying to shield them from oppressive taxation from the emperor. For this leniency and the lack of tax revenue from it, the emperor stripped the governor of his powers and exiled him. The wife and children fled to her family. Years later, they wish to reunite with their patriarch and walk from her family’s house to his region of exile. They rely on themselves until an old priestess offers to house them for the night. She promptly sells them into slavery, splitting up the mother from her children. 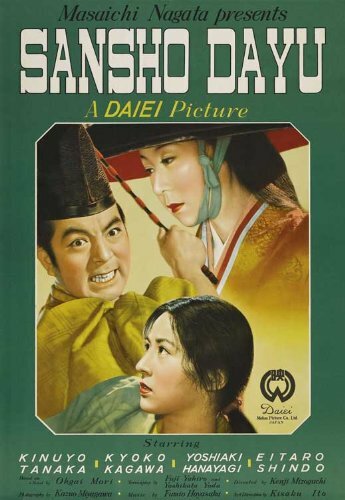 The children are sold to the titular character, Sansho the Bailiff, who is the polar opposite to their father. He is cruel, keeps slaves, brands those that oppose him, and his highly praised by the emperor. This contrast drives at the core of the film. The good man is cast off by government and society, relegated to die a paupers death in a remote region while the bad man is lauded and rewarded. It’s such a pessimistic view of how humanity organizes and operates. The son, though, is provided a miraculous rise in power from slave to governor himself. He burns brightly in his post, using every ounce of his will and his power to arrest Sansho and free his slaves. Once done, he resigns his position and wanders off, in search of his mother. This son has gone through a great journey. He starts the movie repeating his father’s credo again and again (“A man is not a human being without mercy.”), but after ten years a slave, he has become cruel. His sister brings him back to his father’s teachings, as well as a meeting with Sansho’s son, who has fled the manor and become a Buddhist monk. He then follows through on his promise of freeing the slaves. Once his sister helps him regain his humanity, he refuses to let it go. Sansho the Bailiff is really a masterwork. It’s expertly filmed with clear and incredible images that are often perfectly framed. The use of foreground and natural frames (like gates) highlights characters and their mental states. It’s wonderfully written, produced, and acted. It also makes me sad that so few of Kazuo Miyagawa’s films are readily available. There’s a filmography that needs exploring.